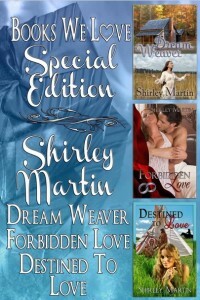 This Shirley Martin Special Edition published by Books We Love contains three novels, Dream Weaver, Forbidden to Love and Destined to Love. Teacher Gwen Emrys has been experiencing some strange visions lately. She sees a man in a cabin in the woods. One of these visions almost causes Gwen to have an accident as it comes on her while she’s driving. Finally, Gwen decides to go visit a restored village. With a detailed map of Fort Pitt in her pocket, a strange thing happens to her and she becomes dizzy and blacks out. When she wakes up, she has no idea where she is. Everything has changed and she now finds herself in the middle of a woods. Her purse is gone, there are no cars, roads or anything other than trees anywhere in the vicinity. Eventually, Gwen comes across a man–and not just any man, but the one from her visions! And so Gwen now finds herself back in the year 1762.